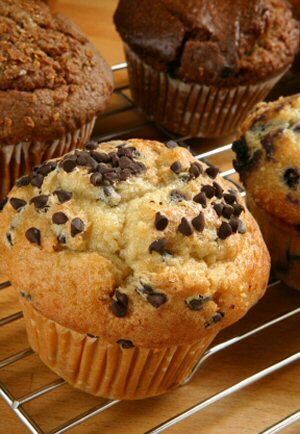 This recipe yields 24 muffins. 1 ½ cups of crushed pineapple, drained. 1 ½ cups of skim milk. Add the beaten eggs, milk and melted butter; then stir until smooth. Add the crushed pineapple and mix thoroughly. Spoon into greased three inch muffin pans, filling three quarters full. Bake at 425°F (220°C) for 20 minutes or until done.